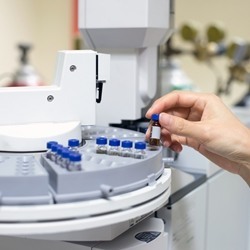 We offer GC/MS (Gas Chromatography/Mass Spectrometry) analysis for perfume and flavor samples, providing you with a list of potential materials. The analysis will not provide specific concentrations of these components, but the percentages provided may be used as a rough guideline of the composition. Please know that if your sample contains any natural essential oils or absolutes, our analysis will only display the compounds that make up these ingredients. We will not be able to determine which essential oils are used. Feel free to call us for more information about this. For this service, we require a 0.5 ml sample of the perfume you are interested in.